Sen. Jon Tester (D., Mont.) on Tuesday said that he would not be supporting President Donald Trump's CIA director nominee Gina Haspel because he is "not a huge fan of waterboarding." Tester, who is facing an uphill reelection battle in a state that Trump won by over 20 points during the 2016 presidential election, cited Haspel's involvement with with the CIA's controversial interrogation program during the early 2000's after the 9/11 terrorist attacks for his opposition to Haspel, according to CNN. "I'm not a huge fan of waterboarding," Tester told CNN on Capitol Hill. This is not the first time that Tester has been opposed to one of Trump's nominees. 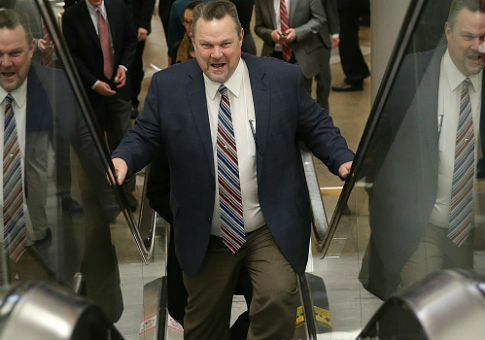 Tester, the top Democrat on the Senate Veterans Affairs Committee, raised concerns last month about Ronny Jackson, Trump's nominee for secretary of veterans affairs. Some of the allegations waged against Jackson included "loosely handled prescription pain medications while serving in the White House medical unit, was intoxicated during an overseas trip, and created a toxic work environment," according to CNN. Trump responded to the allegations by saying that Tester would have a "big price to pay in Montana" for torpedoing Jackson's nomination. Haspel, who has the support of several intelligence officials from the Obama administration, has worked for the CIA since 1985, and if confirmed, she will be the first female CIA director. This entry was posted in National Security and tagged Barack Obama, CIA, Donald Trump, Gina Haspel, Jon Tester. Bookmark the permalink.